Ya gotta love that purplish-pink. The tree people, whom I thought were coming first thing in the morning (but that could have been my bad hearing), didn’t get here till the afternoon. The house across the street had people at work there, too, by then. 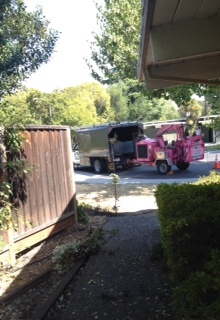 Which means when the plumber came the poor guy had to haul his heavy equipment down the block to get to us. All three men were at it for several hours. When the FedEx guy couldn’t get past all those tree branches on the ground to deliver my twenty pounds of cocoa, the tree guys brought it up to my door so I wouldn’t have to lift it with that broken rib. Bernie, fighting roots, went back to his truck to get something. The tree guys seemed to be wrapping it up. The guy I commissioned the job through (and whom I’ve worked with for years) showed up, took a look around, and told them that that big limb swinging an elbow over the roof had to go, too. Bernie came around the corner and up the walkway just then. Chris, in surprise: “Who are you?” It was a friendly blink. Chris headed out, his guys cut that limb, and one was sweeping up as the other was working the chipper. 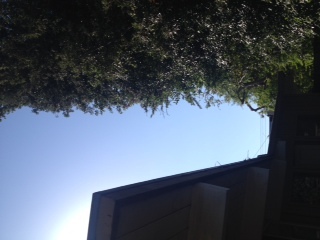 I stepped halfway down the walk and looked up at that towering oak and said, It can’t be over the house. From that vantage point it looked like it was, although looking at it later from the street I wasn’t so sure it had been. They went at it for twenty more minutes and did just that and it looked great. I met them with fresh apple cider after all that hard work, with refills. It is going to take some time to get used to how bright the kitchen is now. You still see green leaves out the windows, but the house is no longer in shadow. It felt this evening like we’d added extra hours of daylight and gone straight back to summer.